The black home interior makes for a unique and dramatic aesthetic. While black can be foreboding and represent a sense of mystery on one hand, it evoke a sense of sophistication, confidence and glamour on the other. In terms of color spectrum, black is created through the absorption of light; in this way, it is all encompassing and has come to be seen as a symbol of authority. 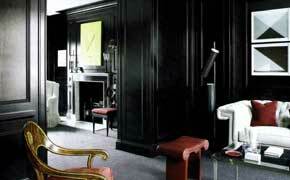 While black is a wonderful color to use in an interior, it works particularly well as a highlight color. 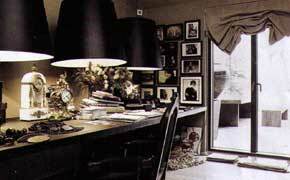 Since a black home interior can exude a depressing feel, use it in bright spaces where there is a surplus of brilliant light that could benefit from black's absorbent quality. The tone of black, whether it is dense or permeable, very much depends on the texture of the material that you're using it on. This in turn affects the look that you're trying to achieve. If you choose a dense shade, in a deep velvet or silk, it will create a sense of sophistication and glamour. Anything with sheen to it makes black look very chic and luxurious. For example, black lacquered furniture makes for a highly formal setting. Black works well with almost every other color of the spectrum. Choose reds and oranges for an upmarket, Eastern flavor. Pair yellow and black for a chic, 60s inspired feel. Add pink for some quirky glamour. Another possibility is to mix black with walnut, chocolate, burnt orange and muted greens. It goes without saying that black's most natural partner is white. The depth of the black offsets the luminosity of the white. In lounge room furnishings, paired with white on the kitchen or bathroom and in the kitchen for those who eat out a lot.